Vegetable Parmesan Quinoa in the Slow Cooker is a healthy, gluten-free, vegetarian dish that is quick and easy to prepare. Eat this for a side dish or a meatless main dish! Click here to see The BEST Slow Cooker Winter Side Dish Recipes! Lauren from Lauren Kelly Nutrition thinks this Vegetable Parmesan Quinoa in the Slow Cooker is perfection in a slow cooker. It’s a perfectly balanced, healthy vegetarian meal, with the quinoa and beans adding the protein you need, plus each serving has a generous helping of vegetables. There’s plenty of protein without any meat but you could easily add some cooked chicken or turkey sausage if you wanted. To make your morning easier chop the vegetables the night before. Then when you want to cook it will just take a few minutes to put everything in the Slow Cooker and dinner will be ready a few hours later. Sounds like my kind of meal! 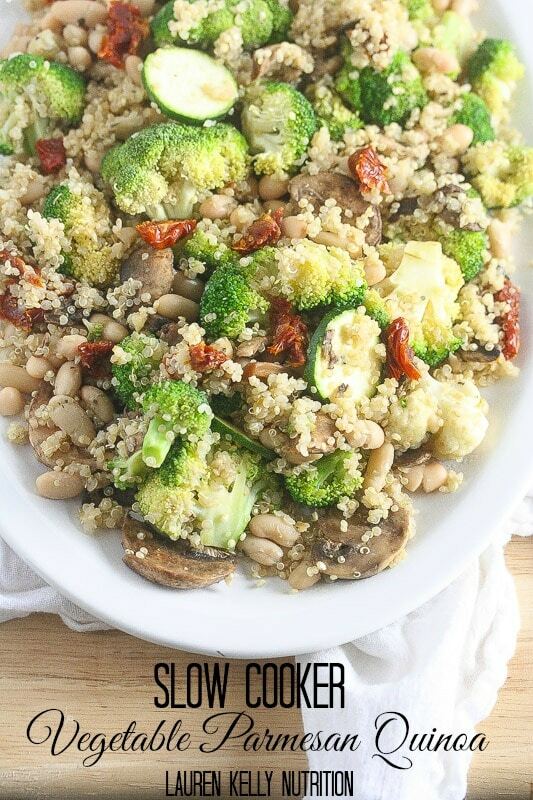 Get the complete recipe for Vegetable Parmesan Quinoa in the Slow Cooker from Lauren Kelly Nutrition. Lauren recommends a 4 or 5-Quart Slow Cooker for this recipe. Use the Index Page for Vegetarian to see all the recipes for Slow Cooker Vegetarian side dishes and dinners that have been featured on this site. This looks healthy….I love vegetables! Thanks Pam; I love the idea of making this and have a side dish for a couple of meals!